Handmade artwork, jewelry, clothing, accessories, paper goods, and more! TWELVE artists and artisans will gather together at the South Street Outdoor Mall to share their work with the Jamaica Plain community as part of the JP First Thursdays Art Stroll. Boston Handmade is a gathering of colleagues who support one another in the pursuit of creativity made by hand. 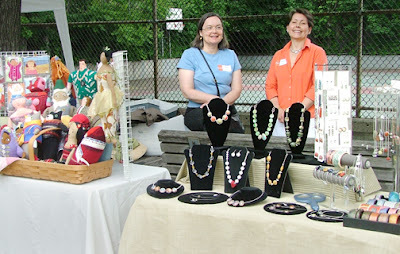 All members of Boston Handmade are registered sellers on Etsy.com and all maintain independent arts businesses in Massachusetts. Members of Boston Handmade create a wide variety of handcrafted goods including: jewelry, soft sculpture, photography, bound books, note cards, collage art, clothing, accessories, dolls, and home décor. Boston Handmade was first formed in March 2007. The twenty-two artists within Boston Handmade collaborate regularly on group shows and support fellow group members’ creative pursuits by hosting workshops and gatherings geared towards learning and sharing arts and business skills. this is great! I will link to it from my blog.